The study, directed by Opinium and commissioned by uSwitch.com for 1,001 adults living throughout the UK, found that 66 per cent of all travellers struggled to connect to on-board WiFi, whilst 56 per cent complained of mobile broadband issues. Forty-three per cent of people said they were incapable of making phone calls due to poor signals, and 38 per cent claimed to be unable to send or receive SMS texts. Furthermore, supported by Transport Focus’s survey of 27,000 UK passengers, only 36 per cent of travellers were satisfied with the reliability and quality of on-board WiFi and internet connectivity. The reason for smartphone usage varied across the board. Nearly half of all respondents said the internet was used to access social media platforms, whilst 39 per cent also used it for listening to music via apps or the radio. 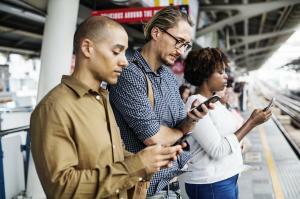 Amongst other uses like for personal messaging, reading, actually working and watching films or television programmes, only a meagre 5 per cent admitted to never using their smartphones during their work commutes. Those with regional journeys in Scotland and Northern England were more likely to suffer from poor connections, with 87 per cent of those polled claiming to be affected by patchy mobile connections over all forms of transport. Although this is less of a problem for those in the Midlands, the figure is still high at 77 per cent. Three top emotions associated with the lack of consistent and reliable internet was “frustration” (66 per cent), “unhappiness” (27 per cent) and “stress” (22 per cent). It appeared that the more important or desired it is to complete a task, the more frustrated travellers became if hindered from carrying it out. Although the National Infrastructure Commission is under the impression that there is an insufficient amount of work being done to improve the situation, the government has pledged to make 1Gbps broadband speeds available on all major UK train routes by 2025. It remains unclear if this can be achieved or not.